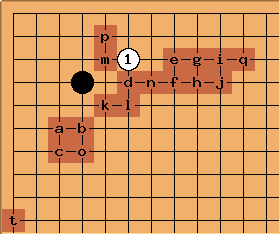 See also JosekiQuickReference and for a complete overview:44PointJosekis. Special-purpose pincer not ordinarily found in modern professional play. 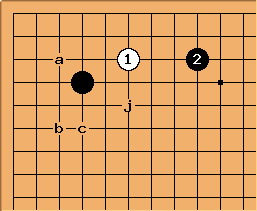 White's ordinary answers are at a, b and c. The jump out at j, standard in old Chinese games, is sometimes seen. 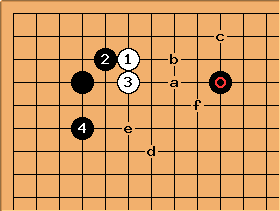 Most of the time, it is assumed that when the diagonal attachment of is played, then there should be a pincering Black stone at or in the vicinity to prevent White from getting a base. 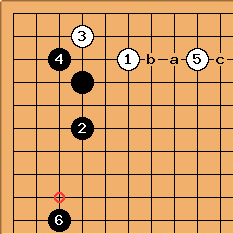 When there is no Black pincer stone at or around a, then the diagonal attachment at is usually a bad idea. 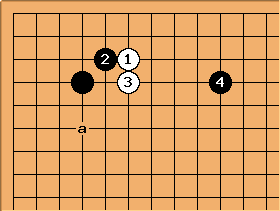 The goal of the attachment is to induce white to add a stone at , thereby making and heavy. 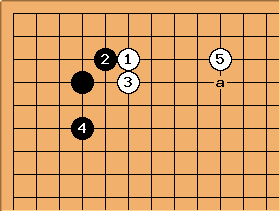 However, without a pre-existing black pincer, white has sente to play (or a), an ideal extension, and black has thereby made white strong, rather than heavy. 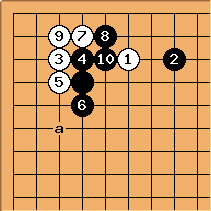 Additionally, the black corner is not secure territory, so Black has suffered a loss. 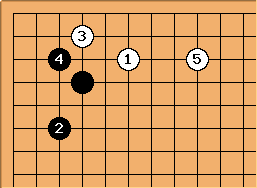 See also section (ii) of joseki as a source of bad habits.